The page below is an old version of my Business Plan for a New Political Party. Due to popular demand, I have updated the Plan considerably and put it into Kindle Format. You can buy it here. Yes, it costs a bit of money. But the return on investment is enormous if you are serious about starting a political party. OK, I have said enough here. I had written more Libertarian Party strategy essays for libertyforall.net, back when I was still a party member. Apply these lessons, or not, as you will. I have personally lost patience with internal LP politics, so I am now focusing my efforts on launching a new party, the subject of Part 5. 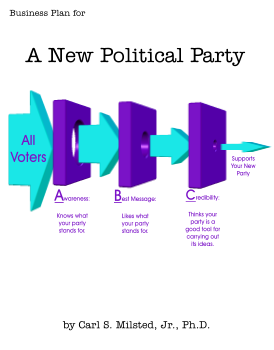 Those of you wishing to reform an existing party may find a few interesting pointers there as well. Copyright 2007, Carl S. Milsted, Jr. All rights reserved.